Petr&Mazepa: Every time when these darling Soviets ask for a repost – we repost. No-one hears Donbas as keenly as we do. 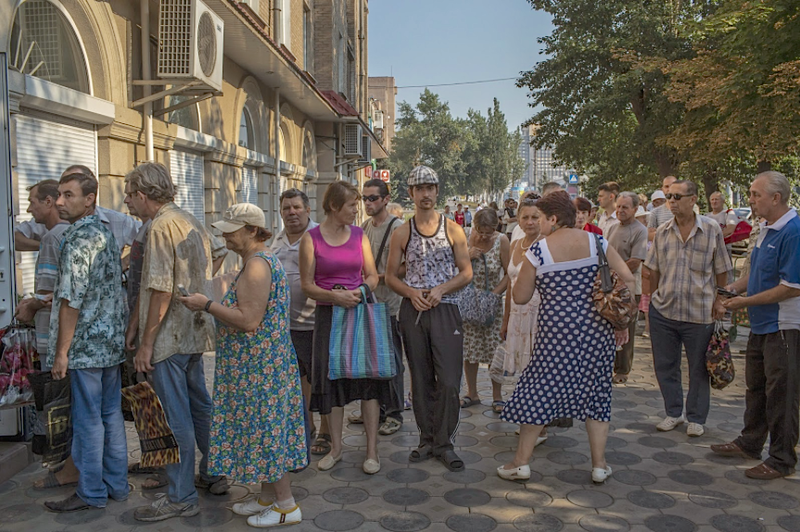 Bread line, Luhansk. Photo: Mauricio Lima for The New York Times. I found this in the comments. I am speaking to the residents of our beloved Donbas. From the time when we have chosen our path, we have had to live through many challenges. We were ready for them. We wanted to build our successful and independent republic. I know that not everyone felt like this. But what we do have, is not what our husbands and sons fought and continue to fight for. They drew global perspectives and help from Russia. We don’t know how, why, because of what, but we are already living on the edge of extinction. Nothing of what was promised was done. With our consent a government was formed. Which is completely uncaring towards us. This is saying it politely. They find means and money for the war, but not for simple people, mothers, pensioners, the sick, the disabled. Where is all our money going? Why is it that on other territories, where the Nazis came, they receive money and do not know what hunger is? How long can this continue? We were told that Kyiv does not need us, but as a single mother I received 1,500 hryvnias from Kyiv in benefits, and the DNR gave me 500, but for now only on paper… I had to stand 3-4 hours in a queue in the cold, to be turned away, apparently I did not have all the documents… what is this, mockery or humiliation? Every month we get told to wait one more month, and then another and another… and in the meantime our children sit hungry in basements. We have simply nothing to eat now. There is an impression that no-one needs us, and our government does not need us either. For how long will we eat promises? We have already borrowed as much as we can from whomever we can. Are we people or material that no-one needs? In light of this we are calling all of you to hold a meeting near the administration of every town in our Motherland. If we have to, we’ll block the roads, if we have to, we will come with our children into every Cabinet, to every Checkpoint, by every administration, in every headquarters where our noble government gathers. We are planning to put down an ultimatum! Either they pay us our money, or they can negotiate with the junta and guarantee an opportunity for them to pay us. Mothers, women, fathers!!! We are calling out to you, to our countrymen, to our neighbours. We must all go out in every city to the administration this Sunday at 14:00 and show that the power is with the people and only we decide how it will be. We must demand that we be paid our money. We must live, and not survive. Let us think about our children, our future is in our hands. Together we are strong. I ask for reposts. This entry was posted in "Voices" in English, Analytics, English, Others, South&Eastern Ukraine, War in Donbas and tagged "pro-Russian separatists" awaken, #RussiaInvadedUkraine, #UkraineUnderAttack, #vatniks, Donbas, Ukraine. Bookmark the permalink.